The words comprising the title of this post were the first I spoke in 2015. I’m hoping it’s not an omen. However, it must be said that I never thought I’d care as much about geraniums as I do today. When I moved to this part of Los Angeles, I was told that my neighborhood was an especially good place for gardeners because it didn’t suffer from frosts. This was a lie. If the temperature drops low enough, like it has repeatedly in the last week, it frosts just as easily as it does anywhere else in the world. The plants ice over as if they had been locked in a freezer overnight, and when the morning sun hits them, they melt like your mom at at Tom Skerritt film festival. 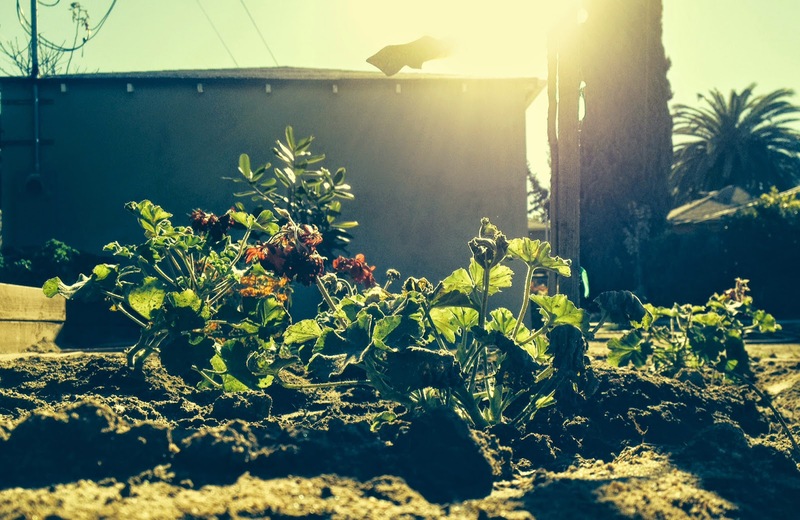 The Great Frost of December 31, 2014, burned the geraniums I had planted, and while this news hadn’t ruined my year, exactly, it did help underscore some changes that had occurred. I spent the last four years living in apartments, where my only me-space was limited to a few walls. I sat inside them and typed away at a computer. Now, I have an outside I can call my own. I’ve grown plants — squash and salad greens and tomatoes and herbs — and spent up to eight hours at a time out under the sun, feet on the dirt, my eyes away from screens. I’ve come to use tiered battle plans in my war against fuzzy mildew, purple nutsedge and cabbage white caterpillars, and there have been days when I can discuss nothing but. Regardless, it all makes me happy. I have time to have thoughts. Yet it somehow didn’t give me any great thoughts that led to writing, hence the fact that I posted here less in 2014 than I did any other year since I began blogging in 2003. I don’t know what this means. I’ve spent the past fourteen years writing for a living, writing for a release, writing to figure out how I feel about the state of things. But in the past six months, even though I’ve had more than enough time to commit words to “paper,” I largely haven’t. More than usual, I feel provoked by this stupid time of year where the days finally start getting longer and you’re meant to consider beginnings and endings. I have to wonder: What the hell will actually make me happy in 2015? A notable counter to all this: I did technically grow corn in 2014. No, this is a lie. 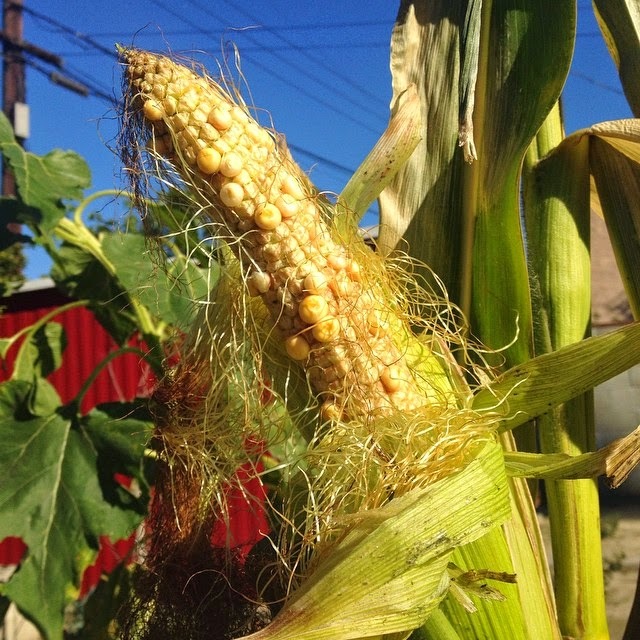 I put a birdseed mix in my bird feeder that included corn, and the birds scattered the corn, and one of the corn kernels happened to land in a garden box where it grew into a plant. Regardless, this was a genuine Almanzo Wilder moment for me. Or at least it was until I unsheathed the ears and found that they looked nothing like the Brentwood gold I’d seen in my state’s finer supermarkets.